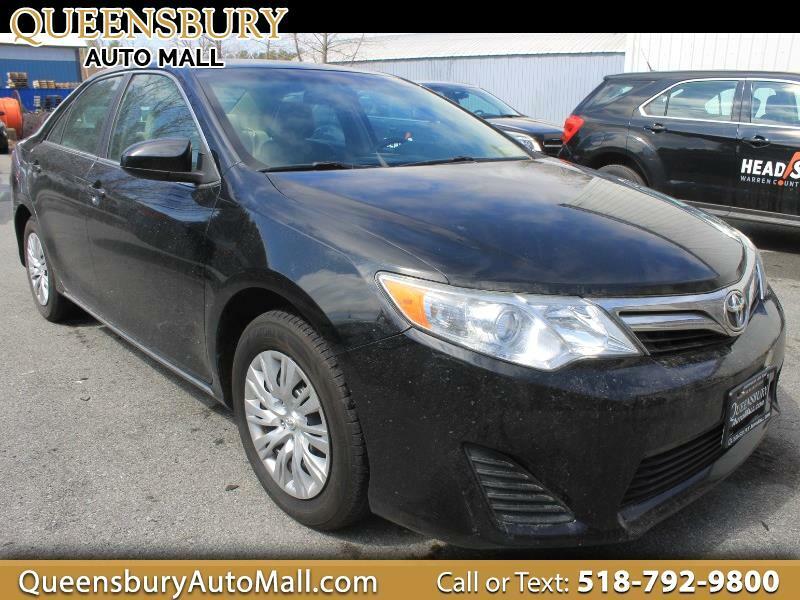 ***HERE'S AN AFFORDABLE, LOW MILED, RELIABLE TOYOTA CAMRY TAX TIME SPECIAL AT QUEENSBURY AUTO MALL - COME TO 635 GLEN STREET IN QUEENSBURY, NY 12804 TO GET A VERY LOW PAYMENT ON A LOW MILED ECO-FRIENDLY SAFE TOYOTA SEDAN - TRADE YOUR OLD RIDE INTO THE AUTO MALL AND SAVE MORE $$$ - DON'T MISS THIS RELIABLE CAR THAT WILL DRIVE FOR ANOTHER 25 YEARS FOR RIGHT PRICE TODAY*** 2.5L L4 DOHC 16V MOTOR! ONE PREVIOUS OWNER! KEYLESS REMOTE ENTRY SYSTEM! POWER DRIVER SEAT WITH LUMBAR SUPPORT! TOUCH LED HOME SCREEN! HANDS FREE WIRELESS BLUETOOTH PHONE CONNECTION WITH HANDS FREE CALLING SYSTEM! AM/FM/CD PLAYER WITH AUXILIARY INPUT JACK, USB IPHONE INTEGRATION, SATELLITE RADIO AND WIRELESS AUDIO STREAMING! TOUCH POWER TRUNK RELEASE! FULL POWER EQUIPMENT! FULL CABIN SAFETY AIRBAG CURTAINS AND SIDE AIRBAGS! CHROME EXTERIOR TRIM PACKAGE! FULL CABIN HEATING AND AIR CONDITIONING! ELECTRONIC TRACTION CONTROL SYSTEM! TILT/TELESCOPE STEERING WHEEL WITH CRUISE CONTROLS, AUDIO CONTROLS AND BLUETOOTH CONTROLS! REAR WINDOW DEFROSTER! DIGITAL CLOCK! 12 VOLT ACCESSORY OUTLETS! PULL DOWN CUP REAR CUP HOLDERS! ALLOY WHEELS ON FRESH TIRES!